During the “global carry trade” period between 2004 and 2007, the euro strongly appreciated against the Swiss franc. Most astonishingly this happened, despite the fact that the Swiss GDP growth was on average 0.5% higher than the one in the Eurozone in these years. The difference was even higher than 2% in 2008 and 2009, a period when the franc finally gained valued. The EU-Swiss bilateral agreements helped to increase the number of foreign workers by 23% between 2005 and 2011; whereas, the number rose by only 10% between 1992 and 2005. As opposed to former migrations into Switzerland, this time foreign employees were mostly highly qualified. Since German wages were relatively low, German personnel like engineers and computer scientists found it attractive to work in Switzerland and were quickly integrated thanks to the common language. The increased migration caused rents to go up by more than 2% per year between 2006 and 2009, even during the global financial crisis. Wages increased similarly, but until 2008 the hikes were far smaller than in the euro zone. This development offered the Swiss a huge competitive advantage visible in high current account surpluses. With the stronger franc, the former advantage became a burden, currency-adjusted wages overtook Spain, Italy and Greece again. Lower inflation in all industrialized countries than previously, thanks to an aging population and cheap imports from developing nations like China. Slow growth and slow wage increases in both Germany and Switzerland between 1997 and 2004. Moderate increases in Swiss housing prices compared to most other countries thanks to more rigid bank requirements after the bad experience of the Swiss housing bust in the 1990s. Lower dependency of Swiss companies on rising oil prices thanks to increased use of water and atomic energy and resulting lower commodity price inflation than the one of the euro zone. Furthermore, the opening of the Swiss market to foreign companies and imported products reduced prices (examples: German low-cost retailers Aldi and Lidl came to Switzerland). The global carry trade favored high-yielding currencies against low-yielders, like the yen and the franc. The Swiss CPI was consistently under the SNB price stability target of 2%. Therefore, the SNB did not see any need to raise interest rates till inflation had become a bit stronger in 2006, and then the ECB first started to hike rates. 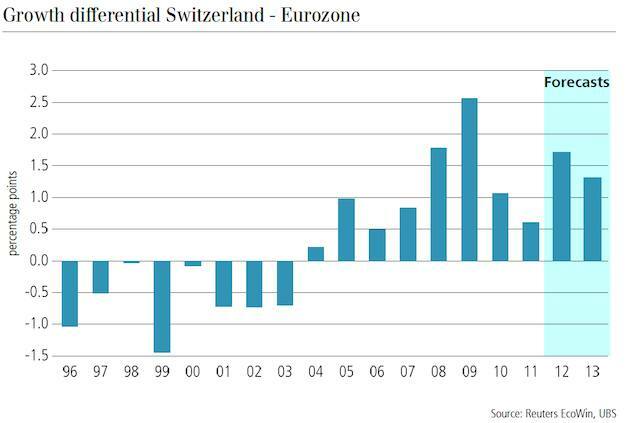 The SNB ignored the stronger Swiss growth. The Swiss Libor rates remained steadily between 0.75% and 1.25% under the ECB rates. This gap together with a high risk appetite caused an undervaluation of the franc between 2004 and 2010, in terms of the real effective exchange rate and purchasing power parity. Thanks to the interest rate differential in a relatively risk-free environment, the euro rose against the CHF from the fairly valued levels of 1.45/1.50 in 2002 to a top of 1.6776 in 2007. Traditionally, the SNB was used to capital in- and outflows, to the volatility of the franc. But the central bank had its main focus on the “Concept 2000”. Affirmed by the low inflation levels they let the Swiss franc depreciate. One other reason for the possibly wrong SNB policy was that many considered the Swiss growth during that period too low; especially, when compared with the countries that experienced a real estate bubble and strong consumer spending caused by the “artificial wealth”. Economists from the Swiss National Bank like Georg Rich1 and Ulrich Kohli2 warranted that things were not that as bad as many thought. Foreign incomes and the gross national income (GNI) were strongly rising until 2007. Already between 2001 and 2004 (green columns, in the graph below), the SNB had intervened in the currency market to prevent an appreciation of the franc, but these interventions were limited. Moreover, the current account surplus was not yet that strong. 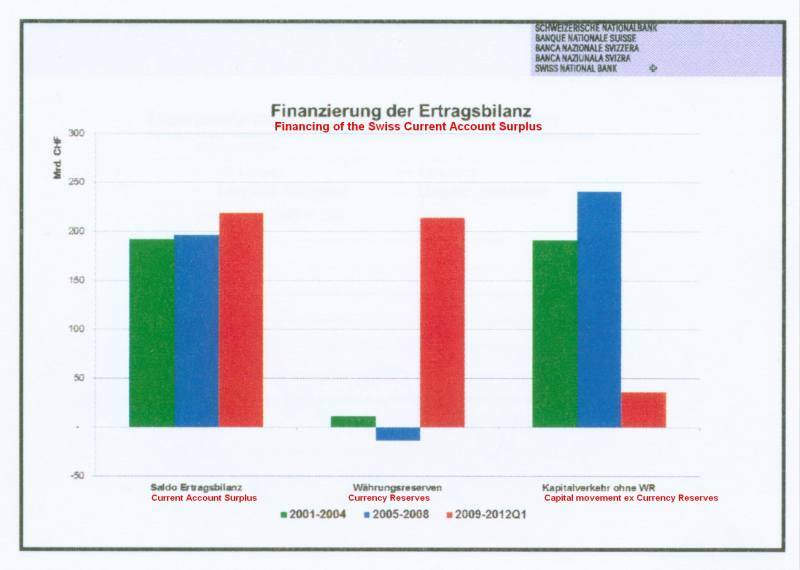 During this “carry trade era” between 2005 and 2008 (blue columns below), the Swiss current account surplus was entirely financed by capital transfers out of Switzerland to foreign countries. The SNB was able to sell some currency reserves. Swiss money remained parked in foreign assets and currencies. The currency was used as a basis for the carry trade and “cheap” Hungarian, Polish and Austrian mortgages. After 2008 (red columns), a smaller part of the current account surplus still leaves Switzerland, but the rest of the current account surplus of Swiss companies must be counter-financed by the Swiss National Bank in the form of currency reserves. The result of this central bank policy was that especially the exporters in metallurgy, machinery and electronics (united in the Swissmem organization) did not perform the necessary innovations. Together with the tourism industry, they were the ones that demanded the introduction of the EUR/CHF floor in 2011. With the outbreak of the subprime crisis in the United States in 2007 the EUR/CHF moved downwards from 1.68 to 1.55, but the SNB left kept an interest rate gap of 1.25% to the ECB. The franc depreciated again towards 1.60.